There is something about the word sacrifice that creates a deep feeling in one. Maybe it resonates with us for the fact that we all have, at one time or another, made a big sacrifice. Maybe it was for the ones we love, for success or simply cutting off something in your life in order to make your life better. Whatever it was, it left a lingering effect in us. Or maybe it was a sacrifice someone made for us. To which we felt one of the deepest feelings unconditional love bestowed on us. I know this was the case for me. 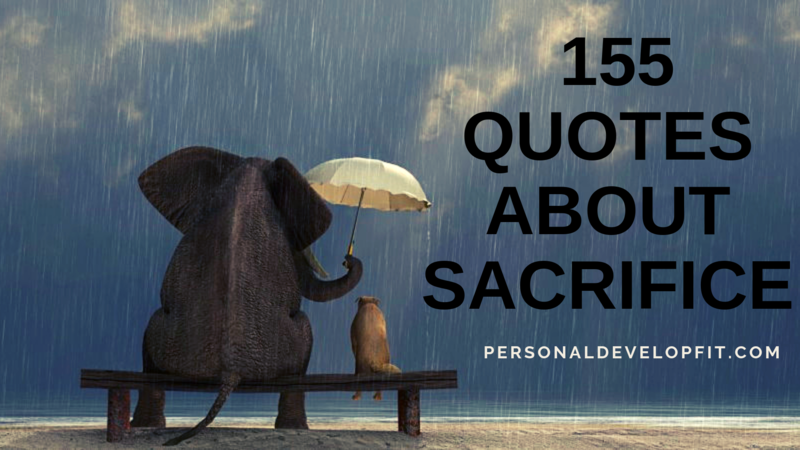 Regardless of what it was, I created this list of quotes about sacrifice to remind us of it’s power in our lives. And for us to use it wisely. And appreciate those who bestow it upon us. “Human progress is neither automatic nor inevitable. Every step toward the goal of justice requires sacrifice, suffering and struggle. The tireless exertions and passionate concern of dedicated individuals.” – Martin Luther King Jr.
“Sometimes you have to sacrifice your own happiness, for other people’s happiness. Even if it is heartbreaking.” – Maria C.